Fix the date: 2018, April the 23 – the 27th, Hannover Messe, Germany. The most important exhibition in the world for the innovative industry, where people can find different interesting areas to find out all the new trends and technologies for their business: Integrated Automation, Motion and Drives; Energy; Industrial Supply; Research and Technology and also a Digital Factory. 225.000 visitors, 70 year editions, more than 500 innovative Industry 4.0 solutions, are only some of the big numbers of Hannover Messe. TMC Transfomers SpA will be present at Hannover Messe 2018 with a 150mq stand, and will welcome you to its world of cast resin transformers for your business. TMC Transformers SpA is a new company, part of Next Technology Group, composed by a high professional team at your service for any enquiry you may need. The applications we cover are from power distribution, converter applications, railway rolling stock, offshore wind power and other forms of renewable energy involving a range of markets from industrial to marine & offshore and oil & gas production. 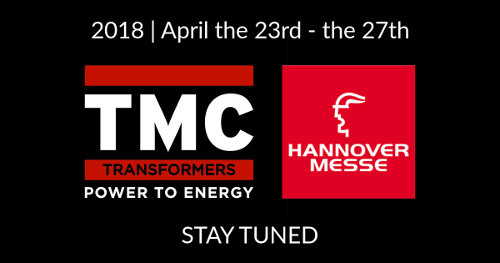 TMC Transformers SpA @ Hannover Messe 2018 | Stay tuned!